KBB.com 10 Most Affordable Cars. Delivers 36 Highway MPG and 28 City MPG! This Ford Fiesta delivers a Regular Unleaded I-4 1.6 L/97 engine powering it's polished transmission. Wheels: 15 Steel w/Covers, Variable intermittent wipers, Urethane Gear Shift Knob. 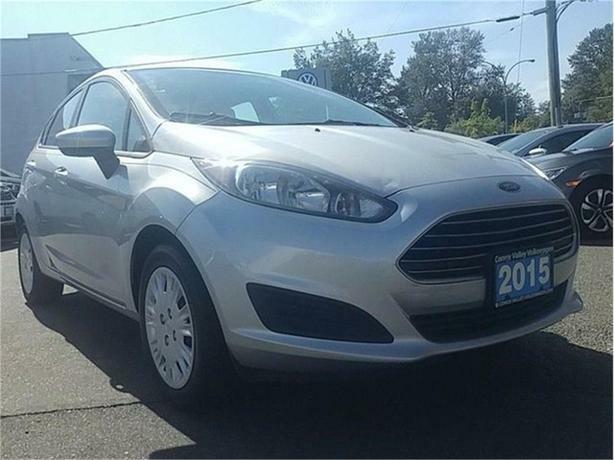 *This Ford Fiesta Comes Equipped with These Options *Transmission: 5-Speed Manual, Torsion Beam Rear Suspension w/Coil Springs, Tires: P185/60R15 BSW, Tailgate/Rear Door Lock Included w/Power Door Locks, SYNC Communications & Entertainment System -inc: 911 Assist, VHR, traffic, directions and information services, redundant audio controls and floor center console w/USB, SYNC Services available for a $60 annual subscription fee, Strut Front Suspension w/Coil Springs, Steel Spare Wheel, Single Stainless Steel Exhaust, Side Impact Beams, Selective Service Internet Access. * This Ford Fiesta is a Superstar! *KBB.com 10 Most Affordable Cars, KBB.com Brand Image Awards. * The Experts' Verdict...*As reported by KBB.com: The 2015 Ford Fiesta offers up great fuel economy, modern build quality and higher-end interior materials, and a slew of modern features, all wrapped up in some of the most stylish subcompact clothes we've ever seen. It does this while keeping a competitive price against its peers. * Visit Us Today *You've earned this- stop by Comox Valley Volkswagen located at 401 RYAN RD, COURTENAY, BC V9N 3R5 to make this car yours today!